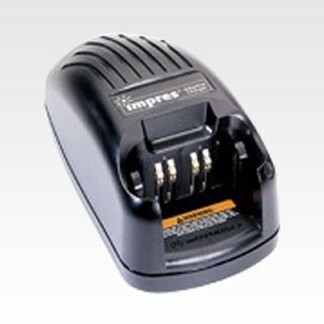 Through the use of advanced charging algorithms and automatic reconditioning features, the IMPRES Smart Energy System®ensures the maximum talk-time and optimized battery cycle life. Talk-time and cycle life are optimized and the need for manual maintenance programs is eliminated. In addition, batteries left in the charger are kept fully charged so they are always ready when needed. This single-unit charger comes with a US Plug and is also capable of charging compatible non-IMPRES batteries. 3.23" x 3.82" x 7.88"